A 1.2m fused test lead set from our RS PRO range offering a high degree of protection to the user when measuring on high energy circuits up to 1000V CAT III. The leads are available with either straight 4mm plugs with retractable shroud, or with right-angled shrouded plugs. Test leads for multimeters are used to test voltage, current, capacitance and other types of testing. 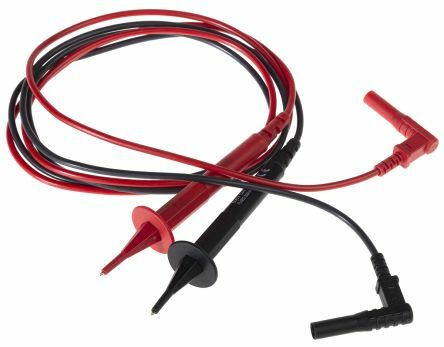 Supplied in a plastic wallet, this test lead kit is available with straight or right-angled 4mm plugs and is suitable for use with most multimeters and insulation testers. Before making any voltage measurements, check the continuity of the leads to ensure that the fuses are intact. 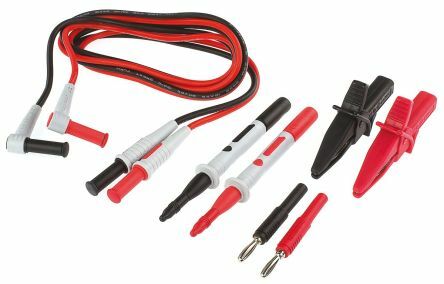 RS PRO have a wide range of test leads, multimeters and accessories that have been RS approved meaning that the products are value for money and high-quality you can rely on. Replacement fuses can be purchased please see RS Stock no. 161-1530. Strain relief is provided at each end of the leads. Thin fine insulated prods set 2627770 for use with fused test prods and multimeter test lead sets. 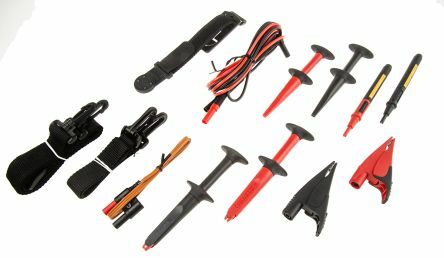 Shuttered lantern probe set 2627786 for use with fused test prods and multimeter test lead sets. Test leads play an important part in electrical measurement especially when connecting a digital multimeter to the unit under test. 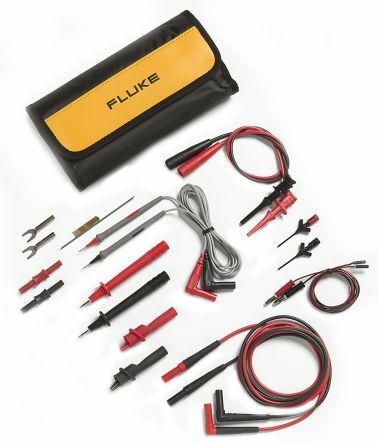 A 1.2m fused test lead set offering a high degree of protection to the user when measuring on high energy circuits up to 1000V CAT III. The leads are available with either straight 4mm plugs with retractable shroud, or with right angled shrouded plugs. Replacement fuses can be purchased please see RS Stock no. 161-1530. Supplied in a plastic wallet, this test lead set is available with straight or right angled 4mm plugs and is suitable for use with most multimeters and insulation testers. Right angled versions are not recommended for use with Megger BM100, BM101, Thurlby 1905, 1503, Fluke 8010, 8050, Wavetek DM25XL, DM93, DM98, AVO 8, AVO 2001 and ITT MX112 multimeters. For these models straight versions are more suitable.